Beginning May 14, 2015, the Center for Victims of Torture acknowledges 30 years of helping torture survivors rebuild their lives and restore their hope. Over the years, CVT has expanded from providing rehabilitative care to torture survivors living in Minnesota to extending interdisciplinary care to survivors in countries around the world. Today, CVT extends interdisciplinary rehabilitative care to survivors and their families at healing centers in St. Paul, Minn., Ethiopia, Jordan, Kenya and Uganda, as well as training and assistance to torture survivor rehabilitation centers in the United States and many countries around the world, as well as engaging in policy advocacy initiatives to end torture. 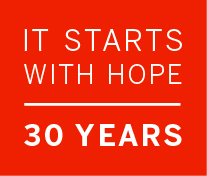 Join CVT in commemorating 30 years of hope. What does hope look like to you? Join us! Visit CVT's It starts with hope project. Share your story, photo or message of hope. Founded in 1985, CVT was the first torture survivor rehabilitation center in the United States and just the third internationally. The organization remains the largest of its kind in the U.S. and one of the largest in the world. Minnesota Governor Rudy Perpich investigates international human rights work and begins the work of establishing a torture survivor rehabilitation center in the state. The Minnesota Center for Torture Victims is established. Within two years, and with assistance from the University of Minnesota, CVT opens a healing center in a small house located on the campus. The welcoming, home-like atmosphere is embraced by survivors. Douglas A. Johnson is hired as executive director of CVT, a role he holds for 23 years. In 1988, President Ronald Reagan signs the UN Convention Against Torture and Other Cruel, Inhuman or Degrading Treatment or Punishment - an important step in the United States' position on torture. CVT moves its healing services to a larger house on the University of Minnesota campus, and shortly thereafter opens an office in Washington, D.C. to centralize its advocacy work. CVT introduces New Tactics in Human Rights, which in 2004 hosts an international symposium for activists from 89 countries. The Torture Victims Relief Act is approved by Congress and signed into law by President Bill Clinton. CVT begins extending care to Sierra Leonean and Liberean refugees in Guinea, a program that runs through 2005. Two years later, CVT opens community-based mental health care programming in Sierra Leone, a program that runs through 2010. CVT adds a second healing center in a house in St. Paul, where rehabilitative care is provided today. CVT opens community-based mental health programming in Liberia, a program that runs through 2008. The following year, an office is opened in the Democratic Republic of Congo, a healing program that runs through 2012. CVT begins providing community-based mental health care in Jordan to Iraqi, and later Syrian, refugees. Later that year, CVT and partners launch the Campaign to Ban Torture. President Barack Obama signs the Executive Order the following year. CVT launches community-based mental health care programming at refugee camps in Dadaab, Kenya. Three years later, an office opens in Nairobi. CVT opens an office in Ethiopia, extending rehabilitative care to Eritrean survivors. On Dec. 9, the U.S. Senate Select Committee on Intelligence releases its report on the CIA's post-9/11 torture program. Why Does Torture Remain So Prevalent Today?